Several weeks ago, I highlighted a beautiful vintage whitework tablecloth, embellished with coronation cord. Since then, I’ve done a little exploring. Besides finding out that Lacis regular offers some coronation cord on their website (I purchased some of theirs to see what it looks like), I found that there’s one book in print still that focuses on coronation cord (called Coronation Cord Remembered, also available through Lacis), and several booklets out of print that highlight the use of coronation cord especially in crochet and tatting, with some mentions of its uses in embroidery. I haven’t explored the whole coronation cord question as much as I’d like to – some day, I will! In the meantime, though, I thought I should show you the stuff available from Lacis. I have to admit, it isn’t quite what I expected. If it’s something you’d like to play around with on whitework, you might want to see it, too, so that you can decide if it’s what you’re looking for. You can purchase coronation cord from Lacis by the foot (at 90¢ per foot) or in 2-yard put-ups for $5.00 for 2 yards. The description doesn’t specify the color. I assumed white, but you know what they say about assuming, don’t you?! In fact, it is ecru – definitely a “raw” unbleached color. The string that wraps the outer layer of the cord is somewhat fuzzy, and it is not mercerized, so there is no sheen to it. It is also quite irregular – not smooth at all. Coronation cord is made in what looks like a kind of double-wrap method. Each bump is made of strings, wrapped to shape the bump, and then the whole cord is wrapped again on the outside, to form the final layer of wraps. When you pull on one string on the end, both strings unravel. Surprisingly enough, the core is made of two little strings that are white-white (!) and mercerized (?). I couldn’t quite figure out why the inside core strings are truly white and mercerized, while the outside is raw, somewhat fuzzy, unbleached string. Where you really see the difference in the quality of the cord is when it is placed next to the white coronation cord on the vintage tablecloth. There’s a huge difference here! The most noticeable is the color. Then, there’s the size (from the books I’ve read, that’s understandable, as coronation cord was available in several different sizes and a whole range of colors). The cord I purchased from Lacis is not as plump. 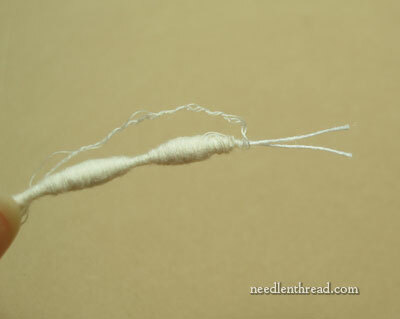 But to me, the most disappointing difference is in the quality of the thread. The white on the vintage tablecloth is a mercerized, smooth thread, and the wrapping of the thread is all very regular and neat. The Lacis cord doesn’t hold a candle to the vintage stuff! 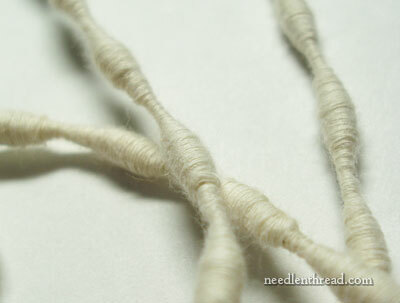 I would be hard pressed to use the cord I purchased in any whitework project where I wanted a “pretty” result. However, I can see its uses for other things. And in fact, I’ll be showing you one of those uses, in my Stitch Play series. I haven’t finished playing with it yet, so my idea might, in fact, be a disaster. But if it works, it could be an interesting way to make use of this coronation cord. 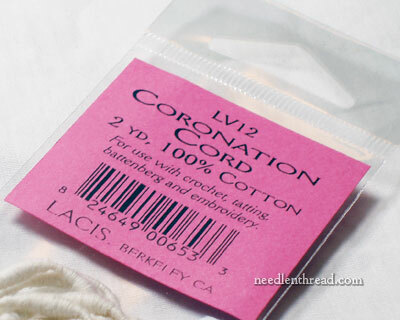 If coronation cord caught your fancy when we talked about it several weeks ago, and you’re on the lookout for the stuff, just be aware that the cord currently available from Lacis is not quite the same quality as the cord that you’ll often see embellishing vintage linens. Incidentally, I received an e-mail from a reader, shortly after the previous article on coronation cord. She came across a beautiful doily at an estate sale right after that article came out, and it was embellished with coronation cord, which she recognized after reading the last article. The lady told her it was trapunto, but she knew better, bought the piece (for only $3.00!) and now has a gorgeous example of coronation cord used in whitework embroidery. The moral of the story: keep your eye out for coronation cord embroidery – you never know where it will turn up, and you may end up picking up something lovely – for a bargain! Things like that, for some reason, never happen to me – but I hope they happen to you! So disappointing. I think I would use this to experiment with colouring, using paint or dye. That’s ok, so do I, Heather, and the stuff produced by Lacis is even more so, because with the fuzziness and the ecru / raw look, they really look like cocoons… But I think it will be useful for what I’m thinking of – we shall see! Maybe that’s why I am interested in it. 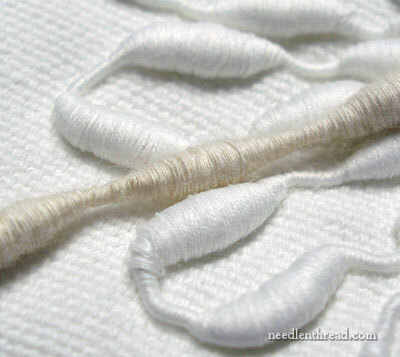 I love playing around with silk fibres both ‘prettied up’ and straight out of the cocoon as well as the cocoons and rods. The Antique Pattern Library might have books/articles on Coronation Cord….most interesting about the differences in modern vs vintage cord. Can’t remember how I arrived here, but I’m DELIGHTED to have found your site! I really enjoy embroidery and never have enough patterns. Also I love learning more about history and stitches etc but there really is a limit to the number of books I can afford to buy on the subject! I’ve been hopping around your site reading this and that, and I copied a couple of your monogramme patterns, they are so very elegant. Thank you for this and I’ve signed up for your newsletter, so I’ll be enjoying more of your company!! I can understand your disappointment with this cord, Mary. But for my purposes it could be perfect: I tend to make, um.. contemporary embroideries, so the very imperfections of this cord would suit me well. Thank you for pointing me the right direction. I can only hope they will post it to Australia without charging the national debt. And I wish you well in finding some white and perfect coronation cord. By the way, why is it called that? If you have any “Restoration” a cleaning product, you might try soaking the coronation cord in that to get it white. Well, you’ve finally done it. You’ve come up with a needlework style/technique/material that not only do I have no interest in doing myself, but also I don’t even want in my house. It reminds me far too much of my early attempts at spinning wool! Thanks Mary for testing the Lacis cord on your dime! 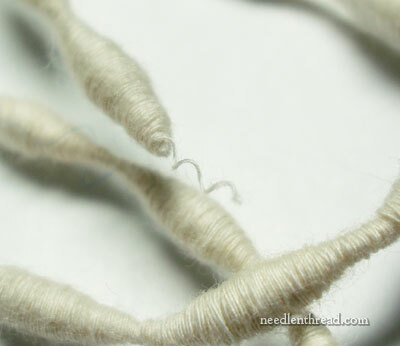 It’s not at all like the vintage cord that is finely spun & has a slight sheen. In addition to other uses you’ve mentioned, vintage cord makes great roses & buds when worked with silk ribbon embroidery. The little bumps can be nested together & look sort of like bullion roses. I do agree with another comment–the Lacis cord could work for a more contemporary application, adding texture & visual interest where the fuzziness & irregularity would be part of the intended design. At least you’ve let us know what to expect if we place an order with Lacis! Mary you are getting a bit scarey…I was looking at this book last week and put it on order. The first book was a no go with me for basically for the same reason. I am looking forward to reading it. It is not so dear either. Second for writing is the coronation rice braid. I love it and had a little bit left that was my Mother’s. It is as white as white and really finely bound and soft. Has not been on my mind for years knowing it is hard to get so I decided to surf. Well I found the Lacis and it does look loose and the colour would not be for white work but ecru crochet. So I surfed on, well bless the computer I turned up some metal bound braid and bought 4 yards alas like you I never hit the sales with any luck and I paid $11 per yard but I had to have it as I thought of a design for gold work. I’ll let you know what they are like and if I bought a pup. I met a lady at embroidery guild and she too whatches your site. Not quite a cheering squad but who knows it might grow. She is doing the Nesting Place and is doing quite well. Have to say she loves it. Cheers for now to you and all. Previous Previous post: Bead Embroidered Sculptures!